We have now fully updated our guide for Dublin (and Ireland). After London, Paris, Montreal, and Dublin, the guide has been fully reviewed and extended, and with 113 pages (PDF) of information you will read the most complete guide to prepare your expatriation to Spain and to Madrid. The capital of Spain, Madrid (3,2 million inhabitants in 2016) is the country largest city. 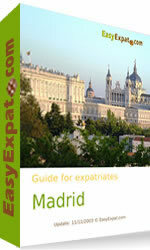 It is also the capital of the autonomous region and province of Madrid. Figures from the OECD (Organization for Economic Co-operation and Development) show that Spanish economic growth has been strong and balanced in 2017, and it is projected to moderate but remain robust in 2018 and 2019. Domestic demand will ease, as the support provided by low oil prices and lower taxes dissipate. On the other hand, political tensions in Catalonia have increased uncertainty and affected external inversions. Competitiveness gains will continue to support exports, even as external demand growth declines slightly. Inflation is projected to fall to 1.3% in 2018, before bouncing back somewhat in 2019. You can also discuss and share experience in Madrid and Spain in our forum. Last but not least, you can download the full guide in PDF format, in order to read quietly and maybe to upload on your mobile or tablet PC/iPad.